Welcome to University Fire Safety. The effects of fire can be devastating, not only in terms of lives lost and injuries, but also in terms of damage to equipment, property, the environment, business interests and reputation. Good management of fire safety is essential to ensure that fires are unlikely to occur; that if they do occur they are likely to be controlled or contained quickly, effectively and safely; or that, if a fire does occur and grow, everyone is able to escape to a place of total safety easily and quickly. 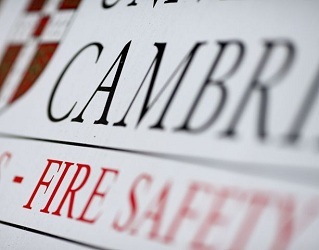 We provide Regulatory and practical Fire Safety advice to University of Cambridge management and staff, ensuring how best to meet relevant standards and practices. In addition, we are responsible for the maintenance and servicing of fire safety systems across the Estate, implementation of Fire Risk Assessments, fire safety inspections and advice on new projects and refurbishments. We aim to deliver the highest level of fire safety advice and support to all stakeholders thereby protecting the University's people, Estate and reputation from the possible consequences of fire. Everyone in the University has a responsibility when it comes to Fire Safety. We must all take reasonable care to ensure our actions do not compromise our own safety or prejudice the safety of others from the effects of Fire. The University has a duty to provide suitable and sufficient training to all its employees upon induction and at periodic intervals thereafter. The Safety Office offers a wide range of standard courses and is pleased to tailor specific courses to suite departmental requirements. For information about availability and booking arrangements please contact safety.training@admin.cam.ac.uk. Personal awareness, prevention of fires and correct action in fire emergencies are all of crucial importance. If you are in doubt, find out by asking your Departmental Administrator or Fire Safety Manager. These pages provide fire safety guidance for use by University staff, students and specific contractors. The guides are designed to help users with simple explanations on how to practically comply with requirements of the Regulatory Reform (Fire Safety) Order 2005 (Fire Safety order) or provide guidance of arrangements and procedures at specific locations or over the Estate as a whole. Please contact universityfiresafety@admin.cam.ac.uk or phone 01223 (3)37822 if you require further information.